Welcome to this week's Market Wrap Podcast, I'm Mike Gleason. Responding to popular demand, we’ll hear a replay my conversation with Steve Forbes. Earlier this year, Mr. Forbes gave a fascinating interview about the presidential election and why he believes the time is now for America to restore gold in our monetary system. My interview with Steve Forbes, billionaire investor and CEO of Forbes, Inc., coming up after this week's market update. Well, the big market moving news this week didn’t come from the Federal Reserve for a change. It came from another powerful market rigging cartel – OPEC. The organization of oil exporters announced a production cut of 800,000 barrels a day. This, OPEC hopes, will keep oil prices supported amidst a global supply glut. Following the announcement, crude oil prices shot up more than $3 to hit $48 per barrel. Conventional producers would like to see oil trade in the $50 to $70 range. That wouldn’t be unreasonable considering that crude traded above $100 as recently as 2014 before crashing to below $30 earlier this year. The one thing the oil market can be counted on to do is wildly overshoot and undershoot equilibrium price levels. The same is often true in the precious metals markets. When gold and silver prices fell below mining production costs in late 2014, the fundamental analysis showed those low price levels to be unsustainable. Yet they persisted longer than many analysts expected. Gold and silver markets finally began pushing higher in 2016. And like crude oil, precious metals still have a long way to go before reaching levels on the charts that could even remotely be regarded as elevated. Precious metals prices sold off early this week and didn’t reap much benefit from the oil price surge mid week. We got off to a good start in the metals today after another negative consumer spending report came out. Gold has pulled back since this morning however and as of this Friday recording the yellow metal trades at $1,323 an ounce, down 1.3% for the week. Silver is still up a bit today with prices currently coming in at $19.38, registering a weekly decline of 1.9%. Platinum is off 2.0% since last Friday’s close to trade at $1,038 per ounce. Palladium, however, is bucking the downward pressure to put in a weekly gain of 3.3%. That brings the palladium price to $727 an ounce. In other news, stocks fell sharply Thursday afternoon on fears that Deutsche Bank could be on the verge of going under. The troubled German bank’s share price has already been nearly obliterated this year. But now the concern is whether other large financial institutions run into similar trouble, potentially setting off another global financial crisis. Here at home, Wells Fargo CEO John Stumpf got grilled on Capitol Hill. The mega bank is under fire for aggressive sales quotas gone wrong. Wells Fargo employees pushed customers to open extra accounts they didn’t want or need. Some even had fee-laden accounts opened in their name without their knowledge or permission. Rogue Wells Fargo staff – or at least that’s what the company will have you believe – created as many as 2 million bogus accounts. Unfortunately, deceptive and high pressure and sometimes outright fraudulent sales tactics remain widespread in some areas of the investing world. Pump and dump schemes involving penny stocks have migrated from boiler rooms to Internet message boards and email lists. But even conservative investors who are only seeking safe investments need to be careful. There are slick TV commercials currently airing on cable news channels that tout the safety and security of precious metals. However, and sadly, almost all of them are based on the tried and true model of bait and switch. The bait is gold and silver itself. The switch comes when you call to inquire about buying gold and silver bullion, and you instead get a sales pitch for proof coins and obscure, supposedly historical, supposedly rare collectible coins. The types of coins they want you to buy inevitably carry huge mark ups over regular bullion coins. It’s easy to get ripped off if you’re unfamiliar with things like numismatic premiums and bid/ask spreads. You may not realize you got a bad deal until months or years later when you discover that you can’t find a buyer for your obscure coins at anywhere near what you paid for them – assuming they were actually rare in the first place, which isn’t always the case. Quite often, a coin dealer might offer you little more than melt value for them. Even over a period of rising spot gold prices, you can still lose money on a gold coin if you paid too steep of a collectible premium to acquire it. When you buy widely recognized bullion products that carry low premiums – exactly the kind of things that Money Metals Exchange sells -- you can be sure your holdings will increase in value as spot prices rise. And you will have absolutely no trouble selling back bullion coins, rounds, and bars into a liquid market. Here at Money Metals Exchange, we will buy back whatever items we sell – and that applies to products that you didn’t purchase from us in the first place. We will tell you the bid/ask spread on a product up front before you buy – we even publish our buy prices on each and every product page on our website for all to see. We don’t treat our customers as monthly sales quotas to be met at any cost. Whether your order is large or small, we aim to earn your trust and loyalty for all of your bullion transactions. Well now, for more on the importance of gold and silver and the role it can and should play as a part of our nation’s monetary policy, let’s get right to our exclusive interview with a well-known billionaire investor and former Presidential candidate. Mike Gleason, Director, Money Metals Exchange: It is my great privilege to welcome Steve Forbes, Editor-in-Chief of Forbes Magazine, CEO of Forbes, Inc. to our Money Metals Exchange podcast. Steve is also author of many fabulous books, including Flat Tax Revolution, How Capitalism Will Save Us, and his latest work, Reviving America: How Repealing Obamacare, Replacing the Tax Code and Reforming the Fed Will Restore Hope and Prosperity. He's also a two-time Presidential candidate, having run in the Republican primaries in both 1996 and 2000. It's a tremendous honor to have him with us today. Mr. Forbes, thank you so much for joining us and welcome. Steve Forbes, CEO of Forbes, Inc.: Good to be with you, Mike. Thank you. Mike Gleason: I want to start out by getting your take on the 2016 Presidential election cycle, especially given your first-hand experience in the whole process. We're seeing an anti-Washington voter revolt of sorts... it's the anti-establishment candidates that have been getting all the momentum. This is especially true on the Republican side, where we see an outsider like Donald Trump currently leading. What's driving this phenomenon, and is this a good thing or a bad thing? Steve Forbes: What it demonstrates is the intense, deep voter dissatisfaction with where the country is and fears about the future. There's contempt for the political class for not being able to handle things. There's the feeling that those who are in charge either don't know what to do, or if they do they don't know how to do it, so people are looking for outsiders for a fresh perspective. Just as in business where incumbents get too comfortable, you always find the entrepreneurial outsiders to challenge the status quo and upend things, and you're seeing the same thing happening on the political side. So who knows if Trump will go all the way, but it's a way of (at least for now) voters expressing dissatisfaction, unhappiness, and saying we want positive change. You cannot continue doing what you're doing. Mike Gleason: The issue of sound money has been getting more attention during the GOP debates than it has in several decades. It's quite encouraging to us at Money Metals Exchange, as proponents of precious metals ownership, to hear Cruz, Paul, Carson, and even Trump bring up issues related to sound money such as reigning in the Federal Reserve. returning to some sort of a gold standard, and adoption of other measures to get America's fiscal house back in order. I'm guessing you probably felt like a lone voice in the wilderness when you raised these subjects during your Presidential runs. So among the current candidates, who do you think best understands the problems created by our current monetary policy and might actually do something about it if elected President? Steve Forbes: I think it's encouraging that a growing number are recognizing there is a problem. Even before you get to solutions you've got to recognize and acknowledge that the way things are being done is not working and that the Federal Reserve has been a huge factor in the sluggishness of the U.S. economy; very, very destructive actions they've taken. I was delighted that Ted Cruz in one of the debates brought up the idea of a gold standard. Rand Paul of course was suckled on the idea of safe and sound money. Ben Carson has made reference to it. Donald Trump has made noises about the Federal Reserve. I think that's a good sign. One of the things that really most of the economics profession doesn't seem to get is that money is simply a means for us to buy and sell with each other. It's like a claim check. You go to a restaurant, check your coat, the claim check has no intrinsic value, but it's a claim on the coat. Money is a claim on products and services. It has no intrinsic value. What it does, it's like a claim check on products and services. It works best when it has a fixed value. Money measures value the way scales measure weight or clocks measure time or rulers measure space and length, and it works best when it's stable. The best way to get stable money, as we explained in our book Reviving America, is precisely to link it to gold the way we did for a hundred and eighty years. It works. Gold is like a ruler. It has a stable value. When you see the price fluctuate, that means that it's the dollar's value that's fluctuating, people's feeling about it for the present and for the future. But gold is like Polaris. It's the North Star. It's fixed. Mike Gleason: That leads me right into my next question here. About a year ago you and Elizabeth Ames co-wrote the book titled Money: How the Destruction of the Dollar Threatens the Global Economy and What We Can Do About It. You proposed a modified gold standard... and I'll quote here, and then I'd like to get your comments. The twenty-first century gold standard would fix the dollar to gold at a particular price. The Federal Reserve would use its tools, primarily open market operations, to keep the value of the dollar tied at that rate of gold. What would be the main benefits of such a reform? And also I'm curious why you stopped short of calling for an end to the Fed all together and a return to true free markets when it comes to gold and the rate of interest? Steve Forbes: In terms of the role of the Federal Reserve, I think you've got to take one step at a time. One of the fears is that if you didn't have the Fed you get a panic, which happens for whatever reason every few years, the thing would spin out of control. I think the key thing now is to get the dollar fixed in value, which we propose in that book, whether it's a thousand dollars an ounce or eleven hundred dollars an ounce. I think the best way to understand this is to imagine what would happen if the Federal Reserve was in charge of the time bureau, and the Fed decides to float the clock, sixty minutes to an hour one day, thirty-five minutes the day after, ninety minutes the day after that. Everyone would know that if you had a fluctuating clock, if your timepieces couldn't keep accurate time, life would be chaotic. The same is true of money when it has a floating value. If you had the floating clock, imagine baking a cake. It says bake the batter thirty minutes. Is that inflation adjusted minutes, nominal minutes, a New York minute, a Mexican minute? Gold is the best way to fix that value. The only role for the Fed, at least for now, would be to keep that fixed value and then deal decisively with the occasional panic, just as the British showed us a hundred and fifty years ago. If you have a panic where banks need the temporary liquidity, they go to the Fed with their collateral, borrow the money at above market interest rate, and then, as the crisis recedes, they quickly pay it back and it's done. So the Fed's role could almost be done by summer interns if they knew what they were doing, so it would not be the monster that it is today where the Fed tries to dictate where credit goes, what happens to the economy, etc. It's really bizarre and destructive. Mike Gleason: They certainly have a whole lot of control and a lot of people have a lot of interest in Fed policy, way too much for our liking, and I'm sure yours as well. Steve Forbes:One other example on that is Janet Yellen, the head of the Federal Reserve, says that we should have two percent inflation, which in her mind is seeing the prices rising two percent a year. If you take a typical American family making fifty thousand bucks a year, that means their costs would go up a thousand dollars a year, two percent of fifty thousand. Who gave her the authority to raise the cost of living, which is an effective tax, a thousand dollars on a typical American family? Yet Congress, they just nod their heads. It's a travesty. Mike Gleason: I've always wondered if two percent is good, isn't three percent better? What about four percent? It seems like it could just go on and on and get higher and higher. Steve Forbes:Yep, which is what happens. An unstable dollar, whether it's weak or strong, is like a timepiece, a watch that is too slow or too fast. Neither one is going to help you. Mike Gleason: Looking at the current economic landscape and the debt-based dominated markets that we have now, the situation appears to have only worsened since the '08 financial crisis, how do you envision this playing out? Are we looking at some kind of economic collapse again or will the Fed and the central planners be able to keep the wheels on this thing? Steve Forbes: Those words “central planners” get to the very problem with the Fed. The idea that the economy is a machine is a preposterous one. The economy is individuals. The idea that you can control people the way you can modulate an automobile is... that's how you get tyranny. That's why in the third part of our book, Reviving America, we talk about Soviet style behavior by the Federal Reserve and by economic policymakers. When you look at the great disasters of the past – like the Great Depression, the terrible inflation of the 1970s, what happened to us in the panic in 2008-2009 – all of those had at their roots disastrous government policy errors. Mike Gleason: I want to talk to you about the role that gold, and to some extent silver, can play into all of this. In your book you've written about gold and its role in an investor's portfolio, but we shouldn't necessarily look at it as an "investment." Talk about that and then also whether you view gold ownership as more or less important now versus say ten, twenty, or thirty years ago. 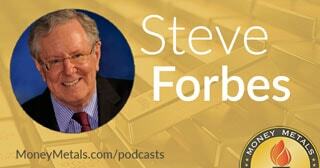 Steve Forbes: In terms of gold, unless you're a jeweler, I see it as an insurance policy. It doesn't build new factories or things like that, new software. What it is is insurance that if things really go wrong you've got something that will balance your portfolio. So whether it's five percent, ten percent, it shouldn't be dominating your portfolio. But since you cannot trust this right now, what politicians do, what you have working out here is a situation where yes, the price of gold has come down since 2011 when it looked like the U.S. Government might default, but today in this kind of environment, is probably a good time. Not that you're going to make quick money on it, but it's like an insurance policy. You hope it doesn't have to be used, but if it does you've got it. Mike Gleason: We talked about how anti-establishment forces are starting to get some momentum. Do you see any real change coming about in our monetary system without some kind of crisis event forcing it? Generally it seems like things don't change unless they're forced. What do you think, is now maybe the time in Washington for some of these politicians to seize on the fact that a lot of Americans are very frustrated and maybe there is the ability to get some traction with some of these radical reforms and getting us back to sound money? Steve Forbes: Well, this is one of the reasons why we did the book. It was to lay out what needs to be done so, if the opportunity or the crisis arises, we have the tools to do it. We had this terrible crisis in 2008-2009, but because policymakers were still holding these obsolete theories and dangerous notions about money, which got us in the crisis in the first place, they not only made mistakes, they invented new mistakes such as Quantitative Easing or zero interest rates. Zero interest rates sounds great, like price controls sound great. You're in an apartment, you only pay ten dollars a month, boy, that sounds great if you don't mind having no maintenance. But when you suppress prices you distort the marketplace, deform the marketplace, people don't invest, and you get stagnation. If the Federal Reserve announced that it was going to put price controls on Big Macs at McDonald's and what you pay for a rental car and things like that, people would say that's outrageous. And the Fed would say we want to suppress prices to stimulate the economy so you have more money to spend. We know it just wrecked the economy. Yet when they do the same thing with interest rates, Congress hardly says boo! The Fed has distorted markets to the point where on zero interest rates, what the Fed in effect did was seize almost four trillion dollars of assets out of economy, made it very easy for those assets to go to the government and the large companies, and starved credit to small and new businesses. Just one statistic, in the last five years the growth of credit to government has gone up thirty-seven percent, growth of credit to corporations thirty-two percent, growth of credit to small businesses and households only six percent. As you know, small and new enterprises are where the bulk of the jobs are created. So the Fed is in the business of credit allocation. That is profoundly wrong and must be changed. Mike Gleason: Where do you see Fed policy going here? Are they truly stuck between a rock and a hard place? What do you think their policies are going to be as we go throughout the year? Steve Forbes: They'll be tempted to stop allowing the market interest rates in the name of saving the economy, which is like taking an anemic patient, a patient suffering from anemia, and bleeding them. With the Fed the “rock and a hard place” (idea) is only in their minds. What they should do is just step aside, let borrowers and lenders determine what interest rates should be, and let the markets function again instead of trying to control them like commissars in the old Soviet Union. Free markets always work when you let them, but the Fed has to be pushed on that. Mike Gleason: As we begin to close here, what do you think it's going to take for gold and silver to become a mainstream asset class again? For example, will it be China or Russia backing its currency with precious metals because the devaluation has gone too far too fast? Something like that? What are your thoughts there as we wrap up? Steve Forbes: Well I think if they see precious metals for what their historic role has been, we have gold-based, gold-backed money today. Remember, gold is a ruler. Because it's got that fixed value, it makes sure that the politicians don't muck around with the integrity of the U.S. dollar. We had a gold standard from the 1790s right through the 1970s, a hundred and eighty years, and it worked very well. We had the most phenomenal growth of any country in the history of the world. Since then we've had more financial crises, more dangerous banking crises, lower economic growth, and we see the stagnation that we have today. So maybe the Russians will get it, maybe the Chinese will get it, but the reason we have this book Reviving America, is to help activist citizens have the tools they need to push and get integrity back to the U.S. dollar, get rid of this horrific tax code, and get patients in charge of healthcare again. We do those things and you'll see the American economy will roar off like a rocket. You should have your gold as that insurance policy and life will be good again. Mike Gleason: Mr. Forbes, I can't thank you enough for your fantastic insights and for being so generous with your time. I very much enjoyed reading your latest book in advance of this interview. You give the reader a great explanation of the history behind all of this, and then also more importantly some practical things that they can do to protect themselves, and we certain urge everyone to check that out. It was great speaking with you today and we wish you and your family and your team there at Forbes and Forbes.com all the best. Thank you so much, and thank you for your continued efforts to spread the ideals of free market and liberty. It's been a real pleasure to talk with you. Steve Forbes: Great pleasure to talk with you. Don't lose faith. Markets are people, and people thrive most when they are free. Mike Gleason: Excellent way to end. That'll do it for this week. Thanks again to Steve Forbes, CEO of Forbes, Inc, Editor-in-Chief of Forbes Magazine, and best-selling author, including his latest work, Reviving America: How Repealing Obamacare, Replacing the Tax Code and Reforming the Fed Will Restore Hope and Prosperity. You can obtain a copy of your own at Amazon.com, download it onto your Kindle or iPad, or purchase it at other places where books are sold. And don't forget to check back here next Friday for our next Weekly Market Wrap Podcast. Until then, this has been Mike Gleason with Money Metals Exchange, thanks for listening and have a great weekend everybody.